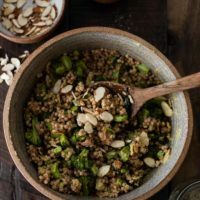 Broccoli Salad with Couscous and Tahini Dressing | Naturally.Broccoli Salad with Couscous and Tahini Dressing | Naturally. Heat your oven to 425˚F. Remove the stems, trim off about 1” from the base, and then peel the stems. Cut into roughly ½” cubes. Chop the florets into bite sized pieces then place both the florets and stems on a sheet tray. Toss with the olive oil and salt. Roast until tender, about 20 minutes. While the broccoli is roasting. Combine the couscous with the broth in a pot. Bring to a boil, reduce to a simmer, and cook until the broth is absorbed and the couscous is tender, about 10 minutes. Remove from heat and let rest while finishing the rest of the recipe. Combine the ingredients for the dressing in a bowl and whisk vigorously. Thin with water if needed, the dressing should be easily pourable- this will help it cover the couscous before it all soaks in. Once everything is ready, toss the broccoli in a bowl along with the couscous, and the sliced almonds. Pour the dressing over and toss until everything is well combined.